Down With Emergency Rule in Pakistan | United We Blog! UWB editorial: We angrily condemn the latest decision of the General Parvez Musharraf government in Pakistan to impose emergency, dismiss the Supreme Court chief justice and black out the private TV stations. It’s not surprising that THE dictator has imposed marshal laws in Pakistan. What is really surprising is why the people of Pakistan are still inside their houses while the dictator is playing with their country every now and then? We vividly remember the brave lawyers’ struggle a few months ago that forced the dictator to bow in front of the Supreme Court and restore the Chief Justice whom he had dismissed for not acting as per his wishes. People of Pakistan must realize that it’s high time they fought the final fight against dictatorship in their country. Pakistan is on the frontline against extremism and the world knows that a democratic government will be able to deal with that more effectively than any dictator. Supporters of Musharraf dictatorship might point out the fact that the country saw better economic growth in the past couple of years, during the Musharraf rule. Our view is that Pakistan could have done better under democracy. Now what will the Americans do? After all, Musharraf is THEIR dictator. Will the green packs still be flowing into Pakistan in the name of fighting extremism so that the dictator can use them to solidify his stand? It’s not a new allegation against the United States that they are showing their double standard in Pakistan. They talk about spreading democracy everywhere in the world and they pat on the shoulders of their dictator in Pakistan. The problem with Pakistani democracy is that it hasn’t been able do discover capable leadership that is worthy of trust. But then even the below-than-average leaders can also deliver the result if they are united. Nepal is an example of such combined effort. What can the Pakistani leadership offer to the people of Pakistan like the 12-point agreement (between the then Seven Political Parties and the Maoist) promised peace to Nepali people? Benazir Bhutto and Nawaz Sharif, along with Imran Khan and other parties, must come together to fight against Musharraf. They can’t fight alone. Musharraf is taking advantage of their division. If they unite and provide concrete hope to the people of Pakistan, no one can stop them from winning the battle against dictatorship. Who are we to comment on other countries offer when we cant figure out our own mess. Leave Pakistan to Pakistanese. I don’t know why the US too condemned the emergency. May be another instance of their double standard. Yes, Down With Emergency Rule and Autocracy in Pakistan. What the Heck, we are not pig like you who are not interested in what’s happening in our neighborhood and the world. We are conscious and democratic citizens of the world who are willing to raise our voice for the freedom and democracy all over the world. Actually the Americans are also under pressure to pull their support off Musharraf’s establishment. In this particular case, the US was advising Musharraf against emergency rule for quite some time. That’s why the US has criticized. I hear Rice has said this is a regrettable incident. I think that’s not enough. In response to Pakistani dictator Pervez Musharraf’s declaration of martial law and illegal dismissal of a Pakistani Supreme Court Justice, I am encouraging all bloggers out there who want true democratic rule for Pakistan’s 165 million people to unite in opposition. From now on, I am asking bloggers to consistantly refer to Musharraf as “Pakistani dictator Pervez Musharraf” consistantly linking back to a post I made explaining this idea in greater detail. The post allows threaded comments, so that those opposed to Pakistani dictator Pervez Musharraf can start discussing ways that we can organize and unite in opposition to his dictatorial actions. My hope is that a consistant message of opposition to martial law and support for democracy in Pakistan can help to influence the media away from legitimizing the Musharraf regime by referring to him as a President. By definition, he cannot be a President if he refuses the right for his government’s Supreme Court to decide whether his running for office is legal or not. Please drop by the post, leave a comment as to what ideas you have on how we can best unite in opposition to martial law, and please do consider using the phrase “Pakistani dictator Pervez Musharraf”, linking back to the post. Emergency rule is not a good thing because it suspends people’s basic rights, but If I am right in my prediction, Emergency rule will be imposed in Nepal within a year or so because of maoists atrocities. The dark cloud of emergency rule is hovering over the sky in Nepal. I don’t give a damn, we have our own problems let’s concentrate on that. this will ultimately let to his downfall and not only the people of pakistan but the world as a general public will see not as a president or prime minister of pakistan but as a wanna be dictator of pakistan. 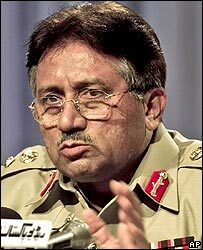 We strongly condemn the acts of Musharraf for imposing the emergency rule in Pakistan. There was no reason what-so-ever for imposing this rule. We support the Pakistani people for their right. What is really surprising is why the people of Pakistan are still inside their houses while the dictator is playing with their country every now and then? You are surprised by this? I am surprised by you. What we nepali people are doing when we have been suffering. What did you do when Gyanendra took over? Did we go out the other day? No, We were on watch and go mood! We watched for one and half year because most of the neplease didnt have belief on political parties. I think the same thing is in Pakistan now. I read few Pakistani’s comment on BBC. There is written the situation is normal and Pakistani people were expecting this day very eagerly. They are fed up with the political leaders. I must mention few are against it too. I dont mean I am with Musraf, just wanted to tell, Wagle it takes time! We might just be looking at our future here in Nepal if the stalemate continues. Dictatorship is always hard to explain and hard to digest. Bad democracy always leads to a dictatorship. This episode should be a lesson to Nepal. I hope our political actors are wiser than the Pakistanis (I know I sound stupid when I say that). Who gild the lily. When people who are buffet and NGO oriented only see the bad to shore up their relevancy- no wonder at the end we get Dictatorship or red at the gate. Talk to dead man walking before you sermon with self serving righteousness. I agree we have our own problems. Pakistan’s problems are far more complex and there is a lot more at stake considering they are a nuclear power. However, I disagree that democracy can better handle religious extremism. If Pakistan was a democracy you would have religious extremists in the mainstream government dictating policies. Has everyone forgotten Hamas? People like Mark Kraft need to really shut the fcuk up. Didn’t know that Pandit blogs from Pakistani embassy! No wonder why you are against democracy here in Nepal. Thanks for making it so loud and clear. The politicians of Nepal should learn a lession from Pakistan. Politician should shut up their fight in parliament and work for the good of the people, otherwise we may see a pakistan hapenning in Nepal. Pakistan will be run by the military for ever. We might see some democratic movement now and then. And US government does not care at all. US preach democracy but it always act differently. Look at the history Carter’s human right policy was directed against Soviet Union not to Chinese. Reagan wants democracy in Soviet Union but not in South America. Bush wants freedom in Nepal but not in Burma. And all the presidents (democrat and republican) want freedom of religion except in Saudi Arabia. Pakistan will be better off if it’s broken into 4 pieces. May be just may be Sindh and Punjab might turn into democratic society. We are not going to learn anything from Pakistani politics. We will be better of if we get rid of the monarchy and have a system of presidential government. I am not against democracy in Nepal. If you think democracy exists in Nepal today then I am totally against anything of the sort. Just because people can come out to the streets, burn tires and vandalize property it doesn’t constitute a democractic system. As for Pakistan, I already said it’s a more complicated matter. “Who are we to comment on other countries offer when we cant figure out our own mess. Leave Pakistan to Pakistanese. ” Amen to that! I only wish we had leaders with Musharref’s courage and determination to save his country from disintegration. Where are our “leaders”?